Personalization adds a unique element to playgrounds, and it also lets you show your school spirit! Versailles Elementary School in Versailles, Ohio, went all out to show their support for the Tigers. By incorporating their school colors—orange and gray—and a couple of personalized panels showing their school mascot, there is no doubt to anyone that visits the playground that it is the home of the Tigers. 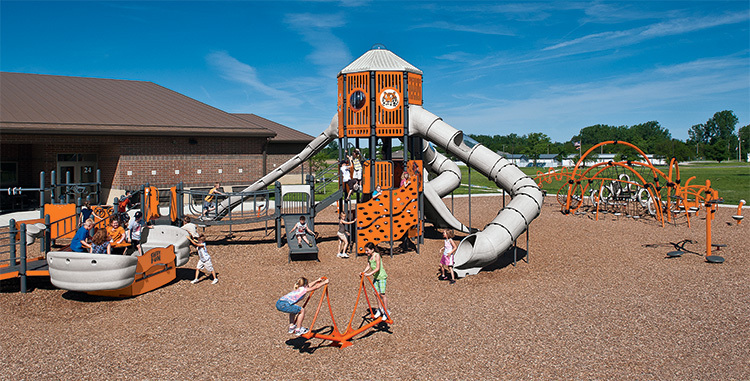 Not only can we help you create an entirely personalized playground like Versailles Elementary, but we can add any level of personalization to best meet your needs. From a personalized welcome sign to playground panels with your school name, motto or mascot, or a customized freestanding play component, we’ll help make your school playground design your own.